FlossieBlossoms: The Doll Quilt Swap was a success! Yesterday, I received the most wonderful package in the mail- it was the doll quilt that was made especially for me, by Christina, The Sometimes Crafter. I was so excited! I had ordered some fabric online so when I got the package, I just assumed it was my fabric. When I noticed the fabric was wrapped in tissue, I got suspicious and when I saw little cat faces peeking at me, I was bumfuzzled- I didn't remember ordering any cat fabric. Then it HIT me! 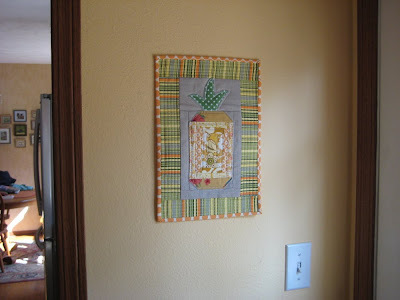 It was my little quilt and I knew exactly who had made it for me and what the other side looked like- it is the coolest pineapple block and it's so me! Also in the package, in its own little glassine envelope- a sweet little month-by-month calendar with the most exquisite photography- the top of each month has a close-up photo of something to do with sewing- either fabric or thread or binding, a tape-measure, etc. I love this so much! I really enjoy things that have "parts" and this set has 13, man, this is so great. lol Really, I was giddy over this calendar. And then to ice my cake, Christina- a fellow pirate aficionado- sent me a fat quarter of some really cool Japanese pirate fabric! Wow. She is a girl after my own heart! She nailed me- knew what I would like, made it happen, sent it all on time, added goodies and the sweetest note ever and I am just still over the moon with it all. Big, huge thanks go out to Christina, the sweetest, cleverest and most talented young woman I've met in a long time! She couldn't have been a better partner for me! I have hung the little quilt by the back door where we'll both see it constantly. It looks outstanding! I've been needing something there and it's just perfect on the apricot colored wall. And unbreakable, which is why that spot's been vacant for years and years. It's a busy little doorway and things get bumped. Doesn't it look great here? And this is the quilt I made for my partner, Kristan.Ellsworth. I sent it out last Saturday, wrapped in a tube for mailing and she received it on Monday, in AZ. I was shocked at the speedy delivery time. She was pleased to get it and I'm glad. 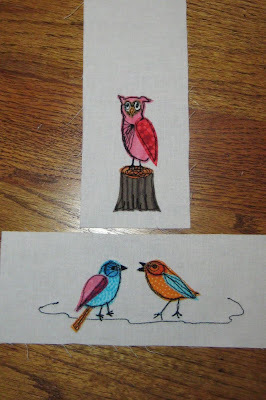 I had fun making it and searching out just the right kind of birds to put on it to give it some life. I had to go get these fabrics because this style and color of quilt was not really my cup of tea, but I liked it very much and it was hard to send it away. So the Doll Quilt Swap is over for now, for me at least, but I'll still have fun watching to see which quilts are received by the other members. 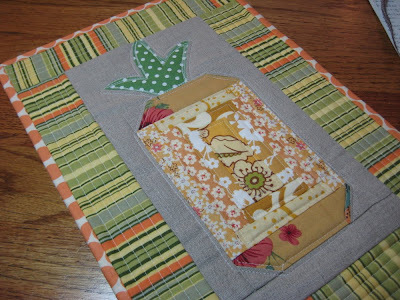 And also- I joined another little swap since this one was so fun- a potholder swap. I have to make 2 potholders for a certain someone. I have an idea of what she likes but I'm off to stalk her and search out more information before I settle down and make her something. This ought to be fun! She's got lots for me to look through, yay! I am hereby sold on swaps, this was so much fun and great entertainment and a real learning experience for me. And it kept me inside during our long, cold winter, too! The quilt you received and the quilt you sent are just beautiful! It is no wonder you are sold on swaps! Your pineapple is perfect there!! She totally got your number, didn't she? Brilliant! And your lucky pot holder swap recipient - I know from experience that your PH's are fantabulous! Oh Flossie! Glad to see that one of our nicest and most active bebe's scored such a perfect quilt! The spot you have hung it is just perfect! The one you made as well was just stunning! See you in round 9!! Fantastic!! 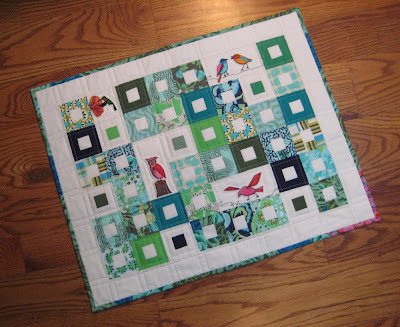 So glad you got your quiltie in and it is a hit! 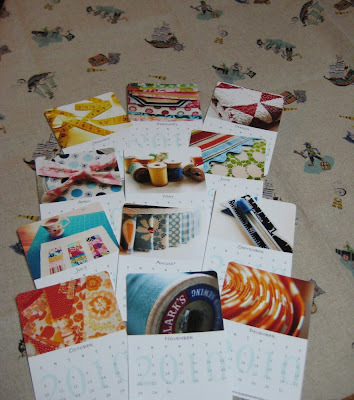 Love that quiltie you sent out.. Only sad thing is it is not coming to me now! But hey.. that's life! My quiltie is on the way and I am super excited! I agree with you, great swap, great fun! I am so glad that you liked it all and so glad to be able to comment and the such without fear of giving myself away. ;) And I do love your NP very much. Can't wait to see more photos of her. 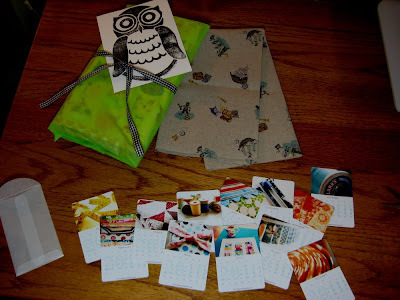 you're so lucky to have gotten Christina's quiltie! And your partner is lucky too! I love your blog header Susan!